This semester I began my first clinical rotation experience at Bishop DuBourg High School. I am starting my first year of the professional program for Saint Louis University’s Master of Athletic Training Program. While being at Bishop DuBourg High School, I have had the opportunity to learn new techniques and improve my clinical skills under my preceptor Nathan Jarman ATC, from SSM Health-SLU Hospital Sports Medicine. I am also at this site with Patrick Coffey, who is an Athlone Institute of Technology student from Ireland. Nathan, Patrick, and I are involved with the care of all fall sports which keeps us on our toes. 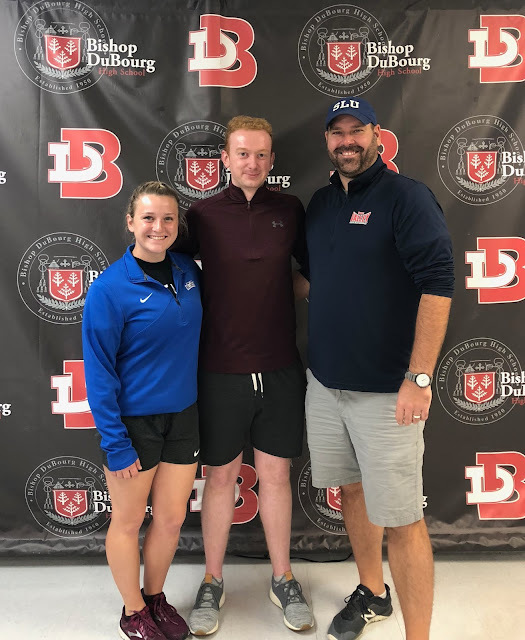 I have felt very welcomed at Bishop DuBourg High School by all of the coaches, staff, athletic director, and especially the student athletes. During my time at Bishop DuBourg High School I have seem various types of injuries such as: ankle sprains, mid-foot sprains, fractured metatarsals, concussions, and different extremity dislocations. Thankfully, there have not been many serious injuries that prevent the athlete from returning to play, nor have we had to make any EMS calls for life-threatening injuries. It has been very interesting to be with an athletic training student from Ireland because I am able to see different approaches I would not normally be able to observe. I am very grateful for the hands-on experience I have at my clinical site, especially after evaluations when we collaborate to develop the best treatment option and rehabilitation programs for each athlete’s specific needs based on our findings. Overall, I am having a great first clinical experience and have learned so much in the few months I have been here. I am excited to see what the rest of the semester will hold!